Ew, Do I Have to Eat That? Snowberries are the cauliflower of the avian menu: edible, yes—even nutritious. But hardly the go-to entrée when a chef is looking to upgrade the restaurant from four stars to that all-important five. Yet it is precisely because of their distastefulness that snowberries might well be the crème de la crème at the Fill. Because birds turn up their beaks at snowberry whenever there are tastier seeds or fruit available in the spring, summer, and fall, the snowberry bushes are still heavily laden with food at the tail end of winter. It is now—when all the grass seeds have been eaten and all the chicory stems stripped—that the birds become desperate enough to eat snowberries. Thus the bad-tasting plants are a life-saving larder for critters who can’t afford a refrigerator. 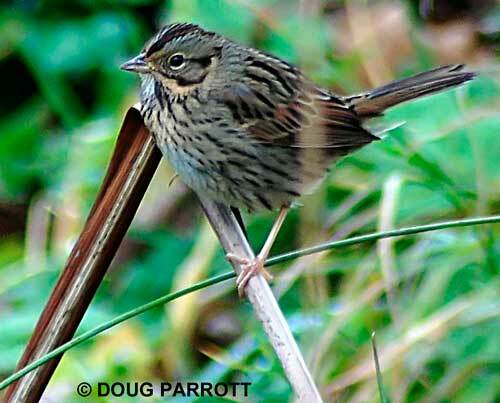 Today a Lincoln’s Sparrow was making use of the pantry at Kern’s Restoration Pond. It hopped up on a snowberry bush, grabbed a marshmallowy berry, and squeezed. The skin split open, and the sparrow dug around inside to unearth a few seeds, spitting out the skin with a birdy “ptooie.” Soon it was joined by a Spotted Towhee and then two Fox Sparrows. As the birds ate their vegetables, I was reminded of the seasonality of nature. This is the lean time of year, when wild creatures must do whatever they can to hang on until the earth tilts again toward the life-giving sun, and summer arrives with its bounty. We humans forget how much the seasons really do dominate the planetary food supply. We’ve grown accustomed to eating grapes in January and apples in May, thanks to the wonders of refrigeration and the speed of air freight. I am glad to watch my favorite sparrows find a food that has been preserved for them not through the inventions of humans but because of the intricate relationships of nature. Snowberries need birds to spread their seeds. Birds need the snowberry even though the plant never bothered to lard its fruit with showy color or sweet taste. Together the snowberry and the sparrow create a balance that benefits both the plant and the bird. Their interconnectedness is the very staff of life. For all that we do to manufacture our own environment apart from nature, we should remember that we too are not just the growers, but the grown. This entry was posted in Uncategorized on January 27, 2011 by constancesidles.